Wow, what a wonderful assortment of photos on this thread - it's just such a pity that we don't know more about them all, as it is a shame to think that so many people are now unknown to us. 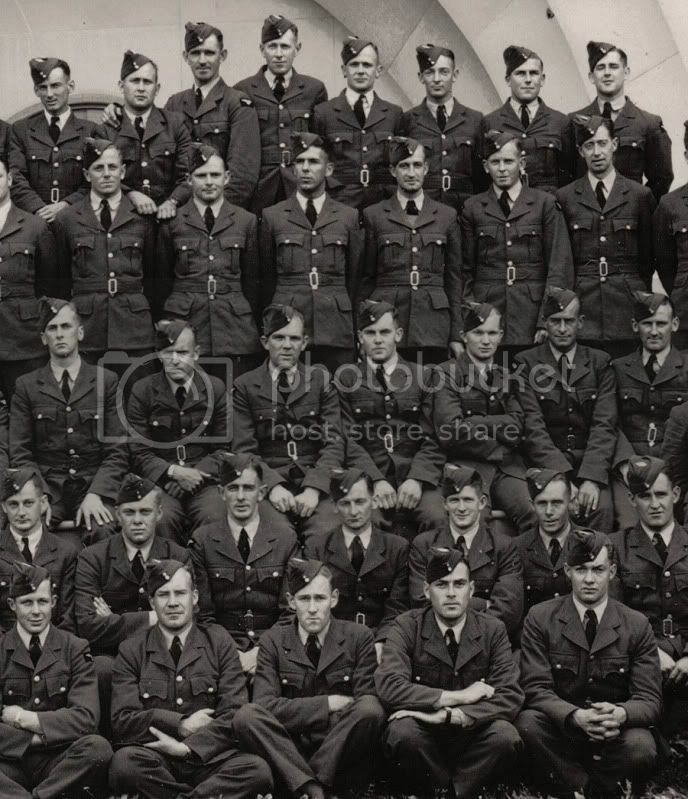 I look at this collection of photos and I can't help but wonder what happened to all these young men: what were their hopes and dreams, did they survive the war and what became of them after they returned to civvie life once hostilities were over? The things that I pick up from the above image is the large wooden sliding hangar doors, and what appears to be the slots in the underside of the wing in the background, which leads me also think that it is possibly a Hudson parked in the background. As to the windows at the back of the hangar - would the strange effect on them be from camouflage netting, or camo paint on the glass? If the above photo was also from Ted Harvie's collection could it actually have been taken in Canada or the UK? He spent time in each country in WWII. Actually, is that Ted - the third from the left?? If yes and it's while he was in NZ it can only be Hobby, Taieri or Tauranga, and maybe Mangere but I don't think they had a hangar there early war, did they? I can't help but wonder what happened to all these young men: what were their hopes and dreams, did they survive the war and what became of them after they returned to civvie life once hostilities were over? Monty Harvie AFC spent 1946 as CFI at the Middle Districts Aero Club, and from 1947-54 he was Aviation Officer with Shell Oil (NZ) Ltd. He seems to have continued to work for Shell after this point in another position. He died in 1997 aged 82. 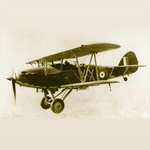 Ted Harvie left the RNZAF on the 7th of December 1945. He returned to the UK in 1949. He then worked in business in Canada through 1950 and 1951. From 1955 to 1960 he worked for BP (NZ) Ltd in Wellington. He then took on a position with the Air Accidents Investigation Branch at Wellington in 1961. He studied at graduate and post-graduate level at the National Air Accident Investigation School in the USA during the 1960's, becoming Chief Inspector of Air Accidents in 1968, a role he filled till 1977. In 1966 his book 'Venture The Far Horizon' was published by Whitcombe and Tombs Ltd, a fantastic book on many of the aviation pioneers in New Zealand history. This includes his own record breaking flights. A highly recommended read. In 1974 his book 'George Bolt: Pioneer Aviator" was also published, by Reed Publishing. He died in 1985, aged 72, leaving a wife, two sons and two daughters. Ted and Monty were two of three brothers in the wartime Air Force. 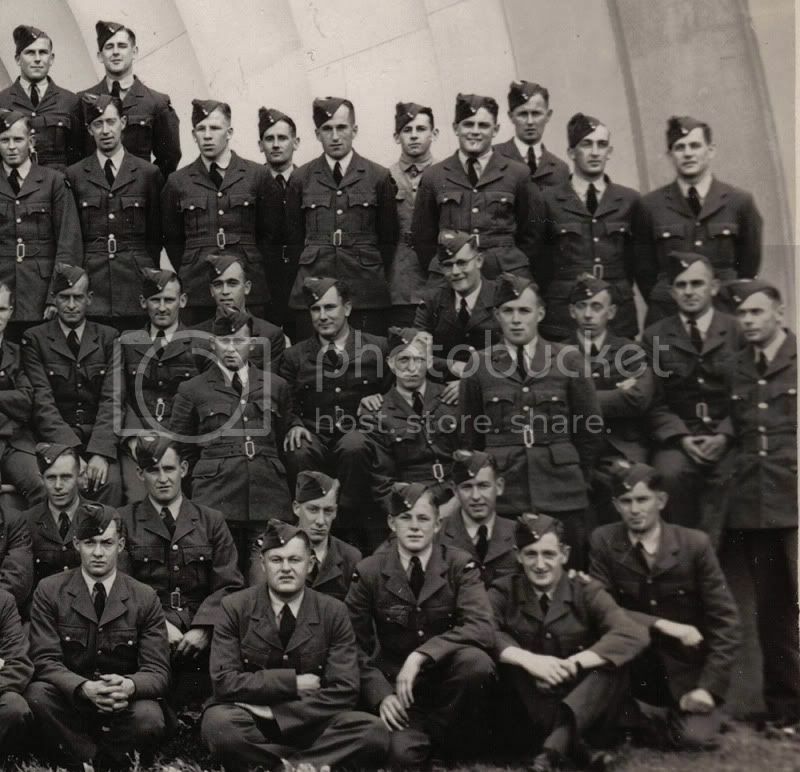 Their brother Guy Harvie had joined the RAF in 1937, and he was sadly killed while flying a No. 57 Squadron Wellington on the 2nd of April 1942. All three Harvies are commemorated for their service on my website. Ralph Court survived the war and as mentioned died only a few weeks ago well into his 90's. Ron Kirkup would become the CO of No. 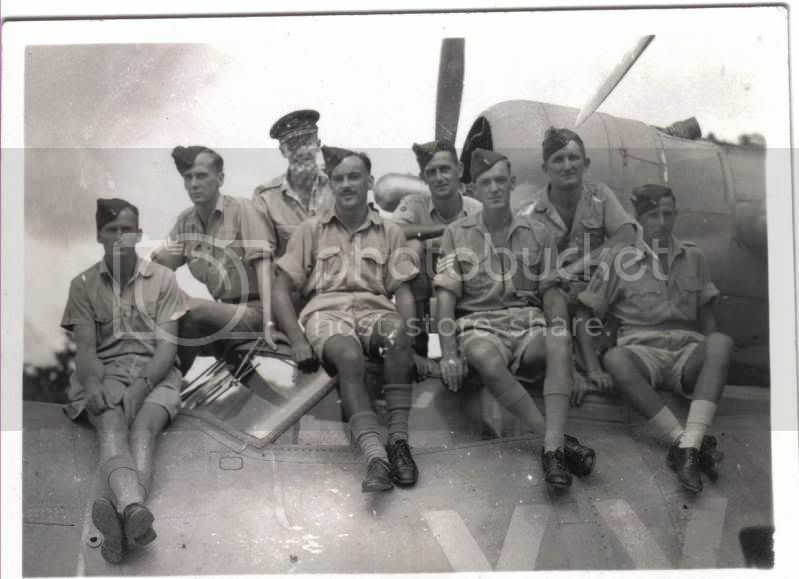 7 Squadron flying Vincents and Vildes around Northland 1942-43, and later he was CO of No. 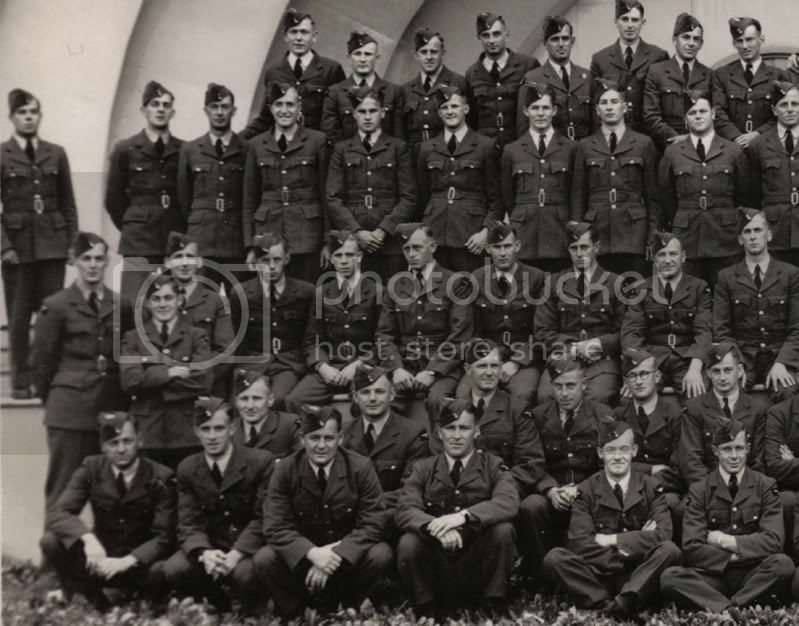 40 Squadron on Dakotas 1944-1946. He went back to farming postwar and passed away in 2001 aged 92. Theo de Lange went on to lead No. 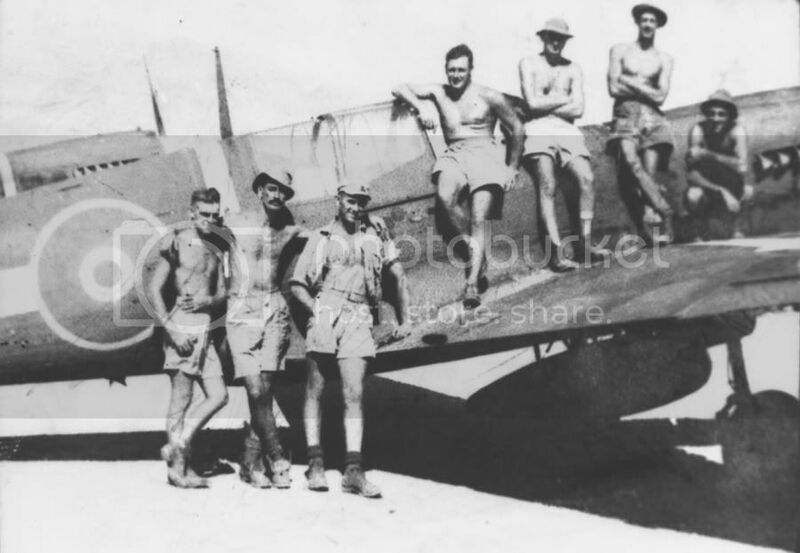 25 (Dive Bomber) Squadron famously. 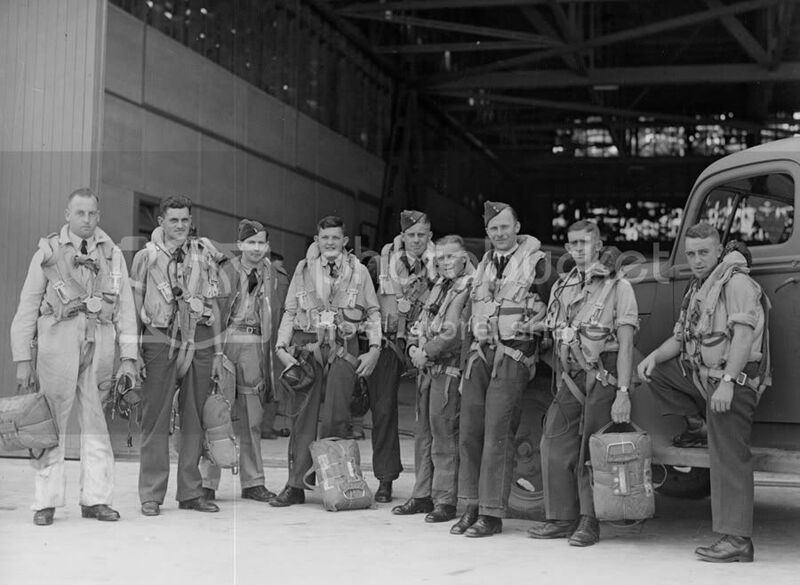 As he was a regular officer pre-war, he continued in the RNZAF after the war well into the 1970's and became Base Commander at Wigram among other posts. He died at the age of 91 in July 2005. I was given some photos from Ron Sinclair's personal collection by his son a few years ago, and this one which was sadly faded and damged was among them. I have cleaned it up a bit but it's sadly not in perfect condition, but I find it really interesting. You don't see too many photos of No. 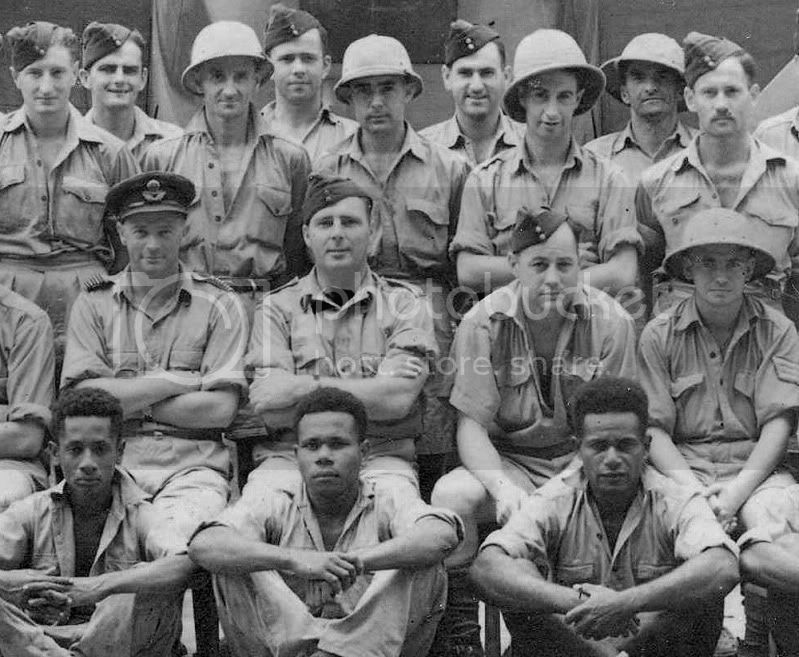 4 (GR) Squadron guys in Fiji. 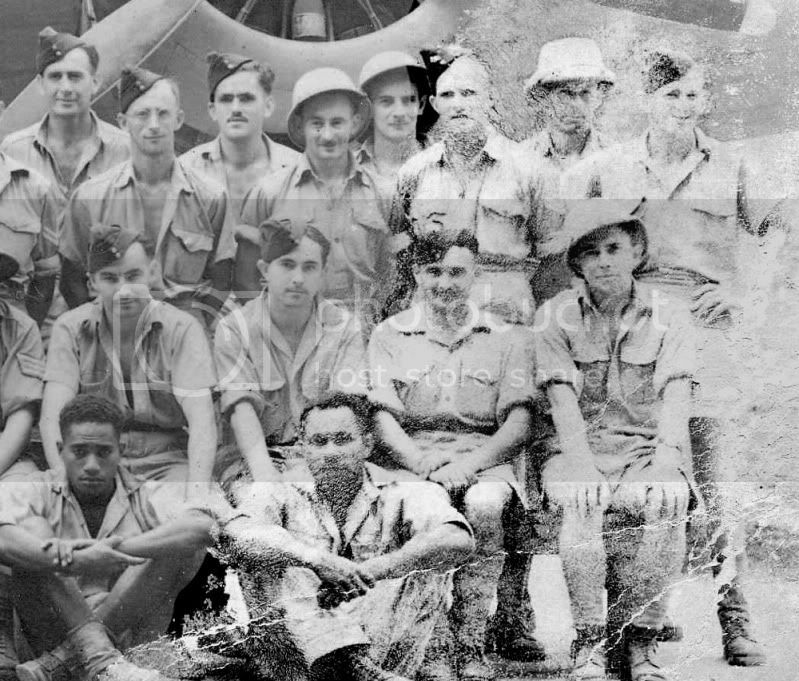 This is the Hangar Staff at Nausori and it is dated 22 December 1942. Apart from Ron himself in the centre in the officer's hat, I have no clues as to who anyone else is. I'll add some close ups form the above shot: I cannot help thinking the chap on the immediate left in the topi helmet looks like the guy O'Keefe ("O'Brien") in Band of Brothers!! It is also neat to see that they included the local Fijian workers in their team photo as well as the kiwis. 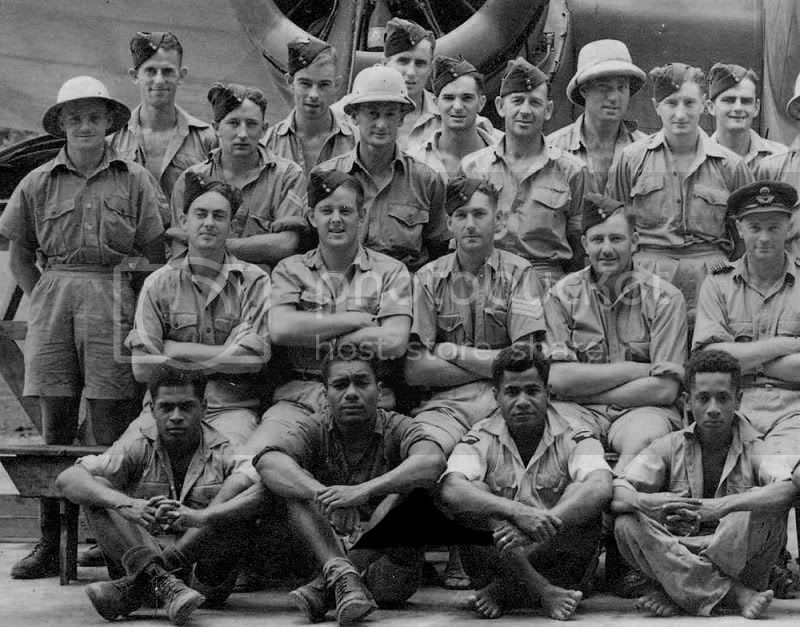 I wonder if those Fijians were actually sworn in as RNZAF ACH's, or were they civilian workers? Note they wear actual uniform with the eagle sleeve title. Can anyone tell me what the aerial on the front of the Hudson is for? Is that part of the radar kit? 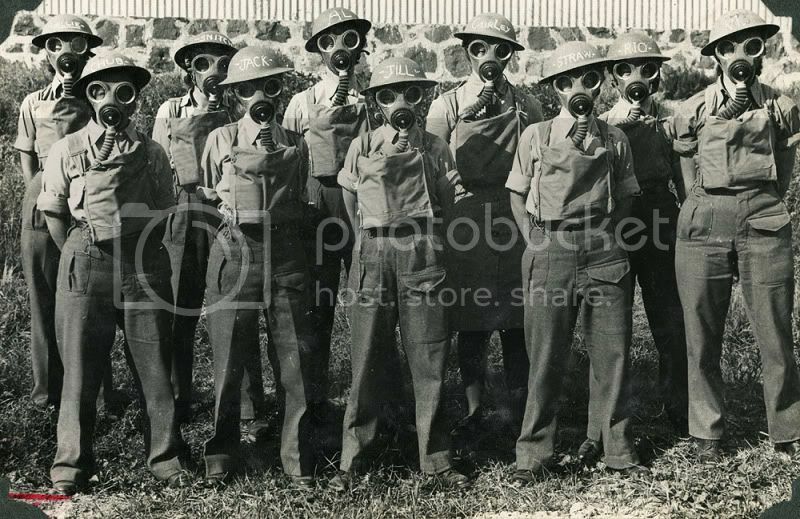 This is one of my favourite group photos from WWII. Not RNZAF but instead they are New Zealand Army girls, all anti-aircraft gunners in Auckland. The photo is from Rita Jackson's collection (nee Waters). The reason I like it so much is their nicknames painted onto their helmets, they're classic. 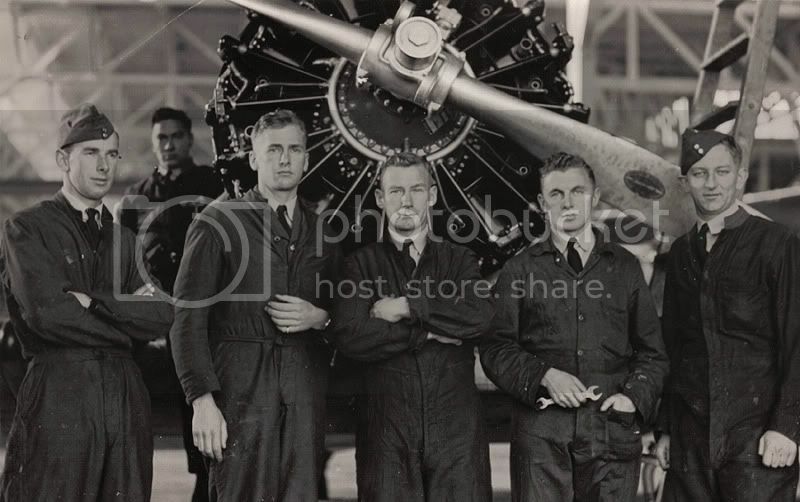 If that is a Hudson in the mystery photo (and that seems most likely) then it can't be No 2 Hangar at Hobsonville as they wouldn't be able to get it up on to the airfield. I'm a bit sad that no-one has recognised anybody in the No. 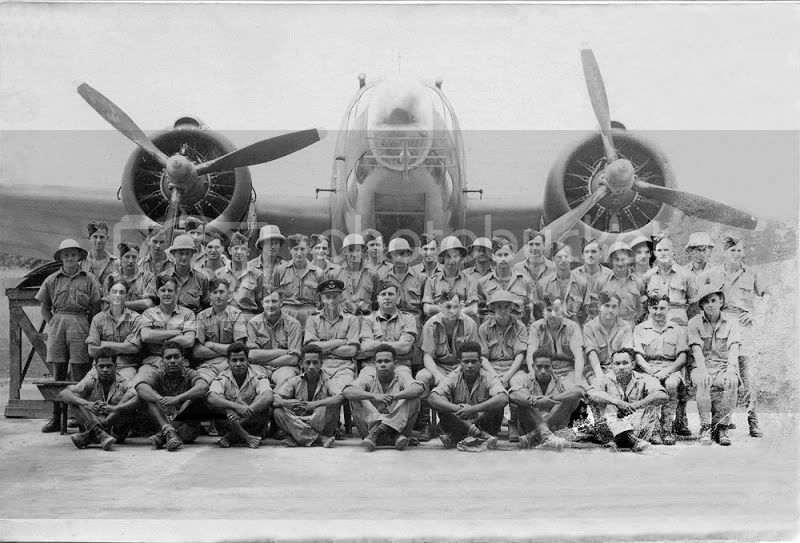 4 (GR) Squadron Nausori Hangar crew photo. I really hoped to get a few names there. A couple of new ones. 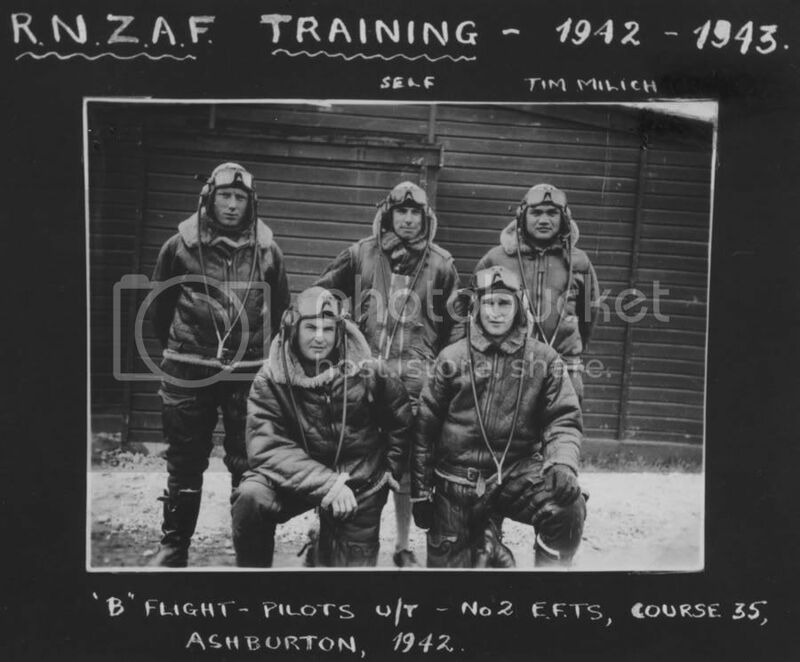 The first a group of five trainee pilots at Ashburton. The centre back one that has self above it should be, J.N.Mills whose name is on the back. 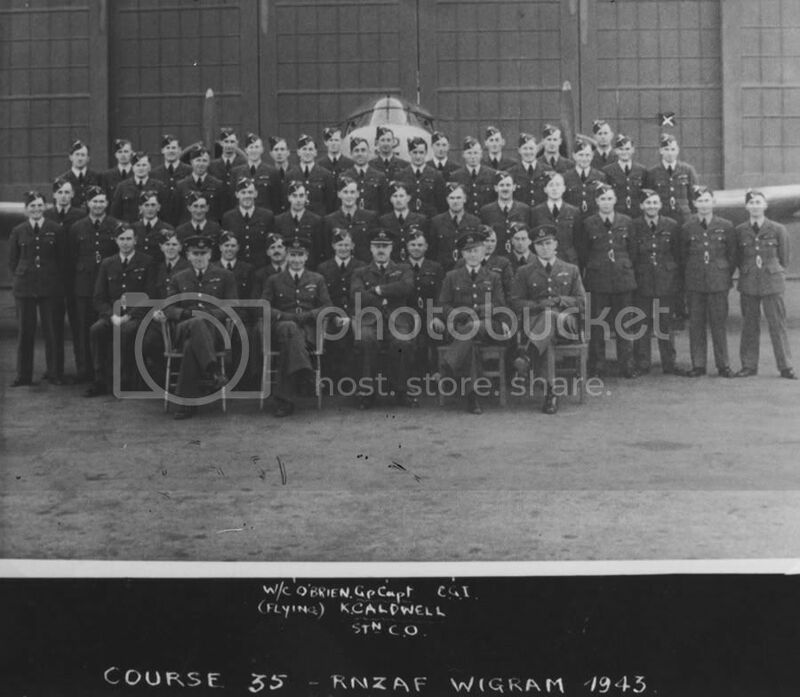 This one is of Course 35, Wigram 1943 with an Oxford behind. Hi to all. Yes, the aerial is the forward emitter aerial of the radar fit. to see what they looked like. Thanks Pete, I thought that was the case but wanted to be certain. Rare to see, less than half our Hudsons had radar fitted. 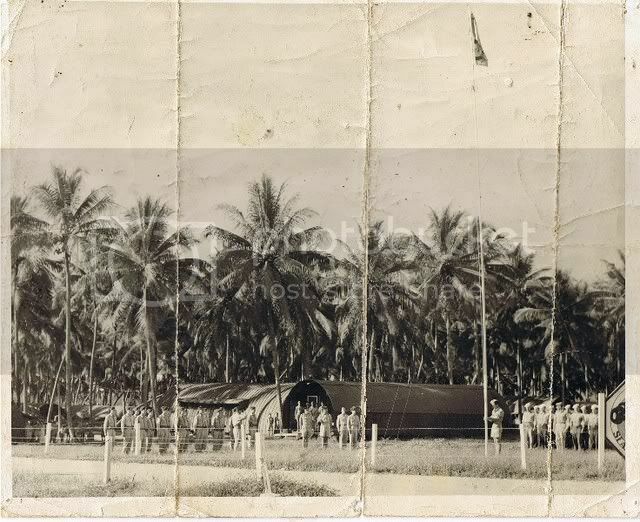 I don't think too many went to Fiji either, most were in the Forward Area. That Course 35 at Ashburton is a tiny course Flight. It looks like most of that intake went onto multis at Wigram. The Wigram photo is unusual in that they have people seated behind the officers like that. I recognised Grid Caldwell instantly but have no idea who the others are. Here's one from the 'box' of photos. This time we have names on the rear, but my question is, what Squadron if anyone recognises the names? Shorty, the truck is a 1940 or 1941 Ford (probably V8, but 6 cylinder was also available for the first time in 1941) 1- 1/2 ton or larger. This is evident by the bonnet side, just forward of the firewall, meeting a removeble side panel, and not continuing all the way down to the mudguard. This was only on the 40-41 model larger trucks. 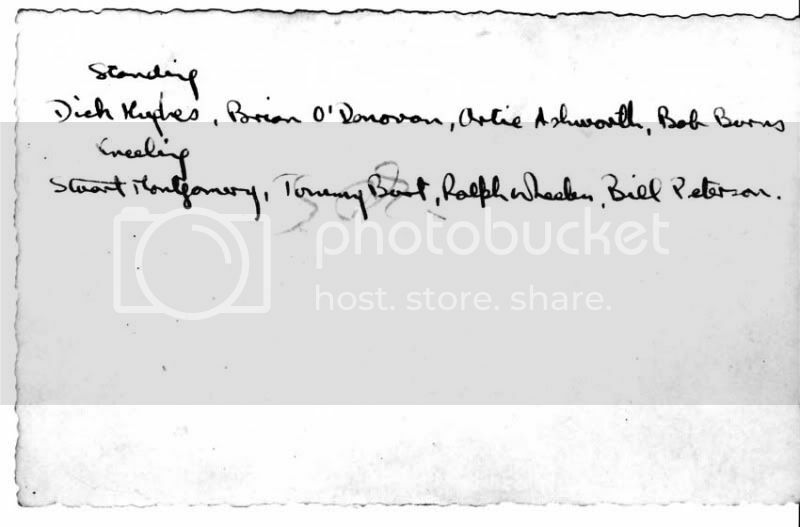 Artie Ashworth was a member of No. 17 (F) Squadron, RNZAF but I think he did another tour on a seperate squadron too. His brother has written a book on him, but I don't have a copy. This one has no reference on the back as to who or where the pilots are. Looks like it is the Pacific Islands somewhere by the tropical dress. 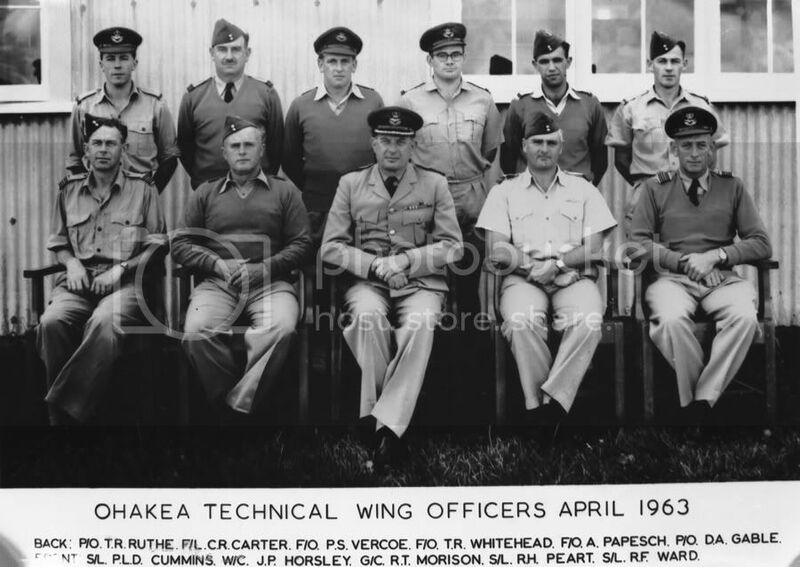 This next one is of the Ohakea Technical Officers 1943. 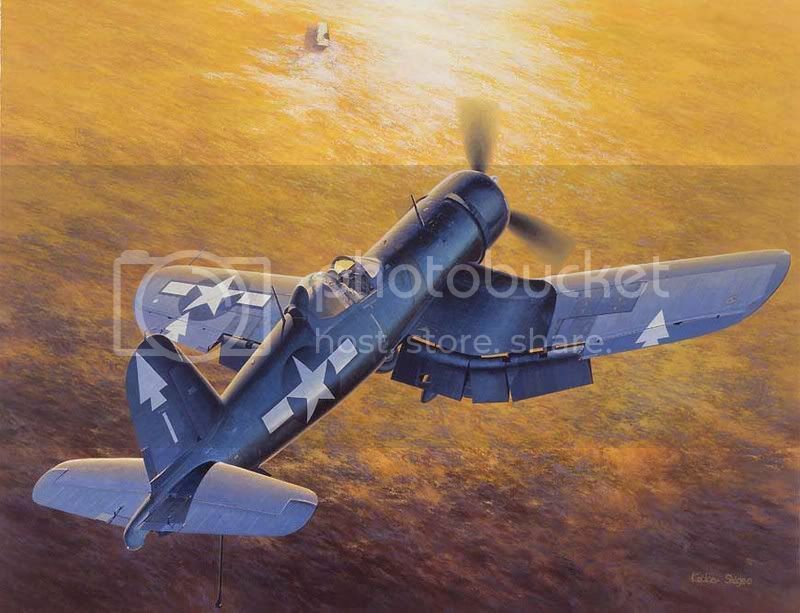 Those guys on the P-40 could more likely be Servicing Unit ground crew rather then pilots. Yes I believe Roger Peart is the identical twin brother of wartime ace Alan Peart DFC. Here are a few more from my Wings Over Cambridge website project. Can anyone add more detail? 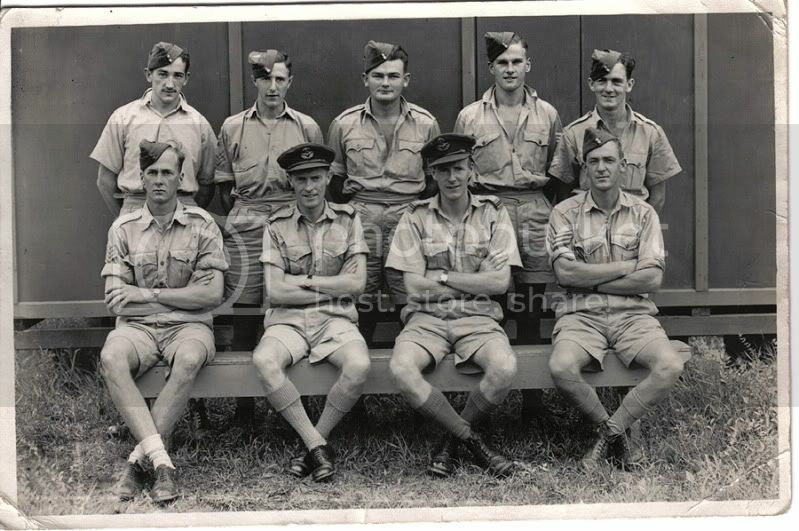 This first one is from the collection of the late Harold Lynds, who was an RNZAF Motor Transport Mechanic/Driver. This is apprently the MT section at Santos. Any ideas? The next photos come from the collection of the late Jim Ross, via his widow, the late Shirley Ross. 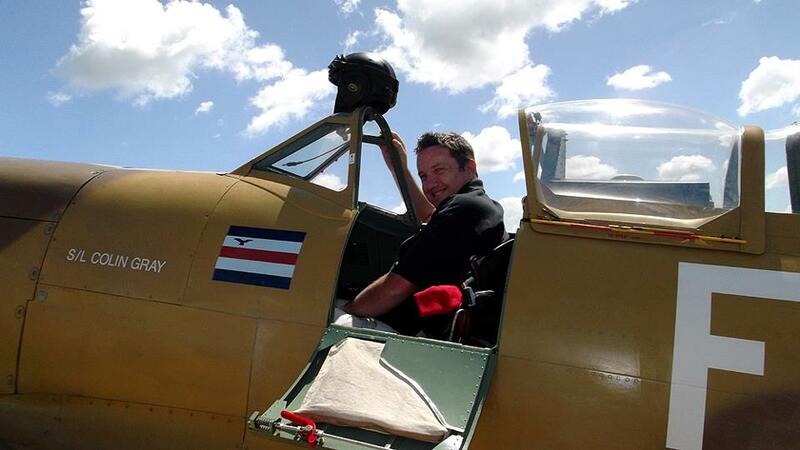 Jim began as a Flight Mechanic, training at Rongotai, posted to No. 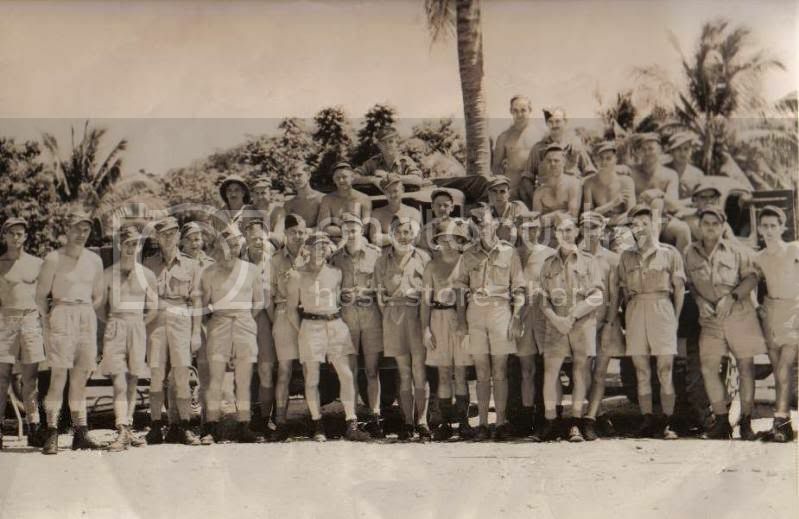 3 GR Squadron, serving at Harewood, Whenuapai, Espiritu Santo and Guadalcanal. he then retrained as a Flight Engineer and went to No. 6 FB Squadron. This first photo if obviously his Catalina crew, Jim is second from the left, but the others are unknown to me. 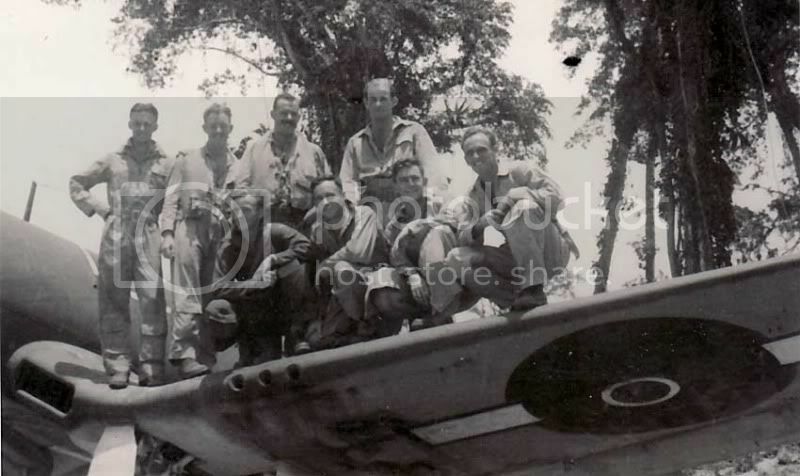 Another shot of what looks to be his Catalina crew. Jim is seated left. Any idea on who the other crew members were? This looks to be at Rongotai during Jim's training. Jim is third from left (counting the chap on the wing). In front of the Sound Shell at Rongotai. As there are many men in this shot I have cropped out three sections to show more detail. 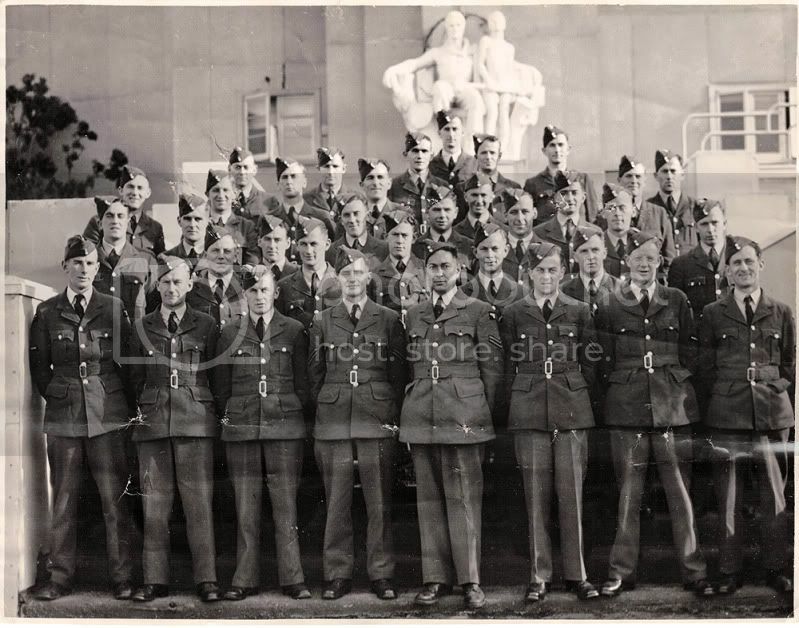 While we are doing group shots I thought I would post this one again, maybe one of the more recently joined members might know something about it such as what, where or when? 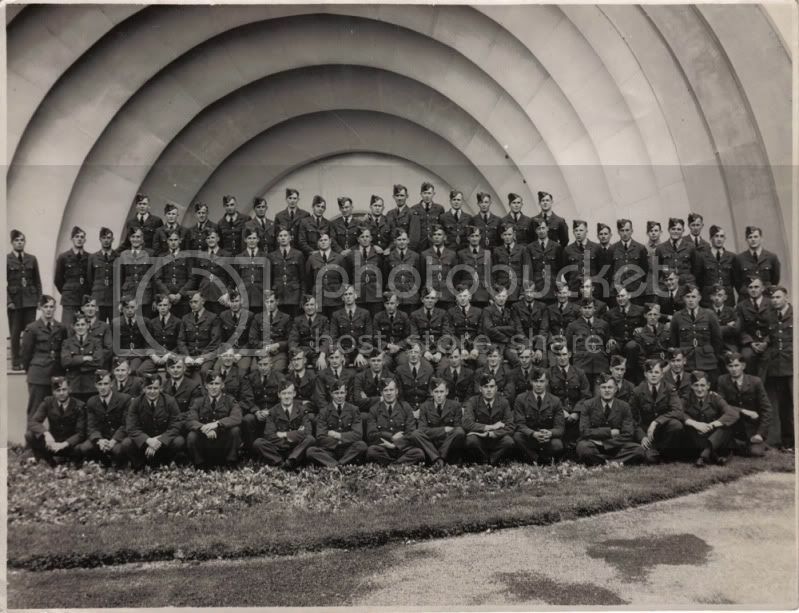 In the sound shell photo does anyone have any ideas as to the different uniform being worn by the chap in the back of the second row down, 5th from the right? It's a lighter colour and a different style to a NZ uniform.